As of 2012, 8% of wine sales at British off-licenses and supermarkets were sauvignon blanc, and the figure keeps rising. This year it will overtake chardonnay, and of all white grapes only pinot grigio, whose juice flows from Italy and through our aisles and tills in vast, flavourless oceans, shifts in greater quantity. 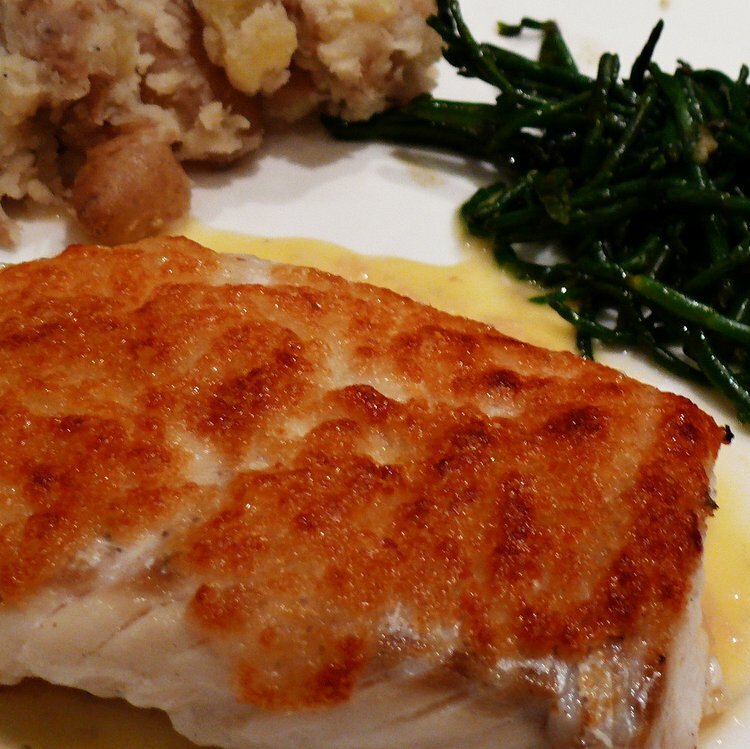 Many of us simply can’t get enough of sauvignon’s grassy, herby freshness. Majestic alone shifts a million bottles a year of a single brand, The Ned, one of the most ludicrously successful of all New Zealand’s ludicrously successful sauvignon stories. As a whole the UK got through 44 million bottles of the Kiwi stuff last year, each of which had to travel some 11,400 miles to reach these shores. Meanwhile the world’s other great sauvignon blanc-producing area, the Loire Valley, is just 250 miles away from London and sends the relatively lilliputian total – and this is all wine from the region, red, white, pink, sweet, fizzy, the lot – of 11m bottles to the UK each year (though sales of their white wines shot up 14% in 2012 compared with the previous year). Yet at this year’s Concours Mondial du Sauvignon, the annual World Cup of sauvignon blanc wines – this competition really does exist, the main difference with football’s slightly more famous World Cup being that in this one the best position by far is “referee” – Loire wines outmedalled New Zealand’s to the tune of seven to one (though to be fair they were playing at home). Marlborough’s overwhelming commercial victory in the battle of the sauvignons represents one of the most astonishing, unlikely successes in the entire history of commerce (I did no research into the history of commerce in the preparation of that wild assertion). According to legend vines were brought to Touraine, the home of Loire savvy production, by St Martin of Tours – that’s him on the left – in the fourth century. It was another Christian who brought wine grapes to New Zealand (draw your own conclusions) in the shape of a missionary called Samuel Marsen. That was in 1819, but sauvignon blanc didn’t make it to Marlborough until 1973, and the first commercial release was in 1980. In the battle for British affections, the Loire had a 1,600-year, 11,000-mile head start, and still fluffed it. Over in Tours they must look at New Zealand’s share of the British white wine market and feel like victims of an act of most heinous larceny. The problem with New Zealand sauvignon blanc, though, is that most of it tastes the same, and after a while that taste can get a little, well, testing. Oz Clarke once summed it up as “brash flavours of gooseberries, passionfruit and lime, or crunchy green asparagus spears”. I don’t mind gooseberries, passionfruit, lime or asparagus, but I’m not a big fan of brash. You can search for less aggressive examples – and people are now trying to make them – but the only way to guarantee that you don’t get an angry one is, in brief, to leave the lot of them on the shelf and buy something else instead. Loire’s wines, by contrast, could never be accused of homogeneity. It’s France’s longest river, flowing for 634 miles from Sancerre and Pouilly-Fume in the east, home of perhaps the world’s most revered sauvignon blancs, and heading west through Touraine and, enclosed within it, the wonderful chenin blancs of Vouvray, past the reds and sparklers of Saumur, the sweet wines of Anjou, once favoured by Britain’s own Henry II (who was born there), before rolling past Muscadet, source of refreshing, reliable and extraordinarily cheap whites, and finally flopping, knackered, into the Atlantic. 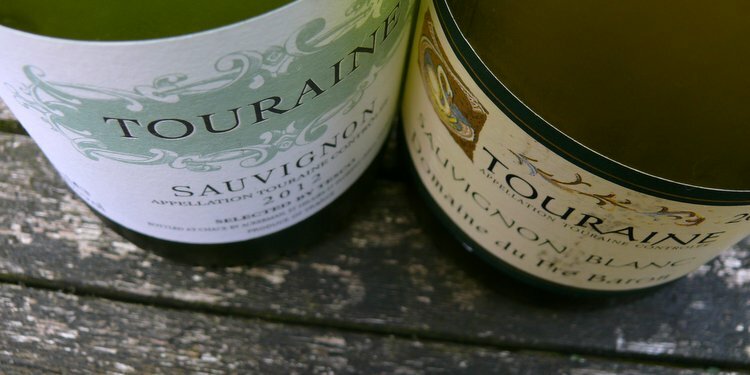 I recently attempted some wine and food matching, not usually my sort of thing, with a couple of Touraine sauvignons the liquid part of the deal. I put some actual genuine effort into it. 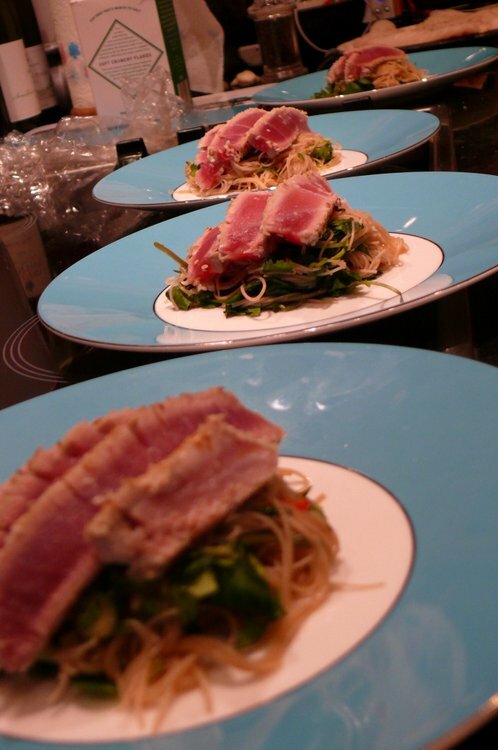 Sesame-crusted seared tuna rested upon a mildly chillified, coriander-heavy rice noodle salad by way of starter; pan-seared cod with a Tomme de Chevre crust, beurre blanc, samphire and crushed potatoes for main. A couple of friends came round. I opened the wine, told them that I’d want to know how they thought it went with the food. They tried the wines, chose their favourites. I served the starter. It was good. They ate it. I asked which wine they thought went better with it, and all of them, every single one, had eaten it all up without pausing between fishy mouthfuls to taste any wine at all. This reminded me why wine and food matching isn’t usually my sort of thing. My opinion, though, is firstly that savvy goes with most sauce-free seafood, so the tuna wasn’t doing any complaining, that its freshness is a fine foil for some gentle chilli heat, and that because many sauvignons are so full of savoury herb flavours, if you find one that doesn’t go too big on those, you can put those herbs into your food instead and everything marries very nicely indeed. The star of the main course was another slab of fish, briefly pan-fried and then spread with a thick layer of special mixture (equal weights of white bread, tomme de chevre and melted butter, mixed in a blender and then stuck in the fridge for a bit) before going under the grill to brown. Sauvignon blanc, as well as being a particular friend of seafood, is also pretty pally with goats’ cheese, and this dish combined the two and threw some of the wine into the beurre blanc to boot. I’m led to believe that they make something similar in the Loire using perch. The wines went very well indeed. The reason the wines worked so well here was partly because I’d gone to some effort to make sure they ruddy well did, and partly because they were those kinds of wine: sociable, the kind that gets on well with others. They weren’t ego wines, determined to hog the attention, or characterless losers that just want to be ignored. The Loire makes a lot of sociable wines, and then sells them at sociable prices. 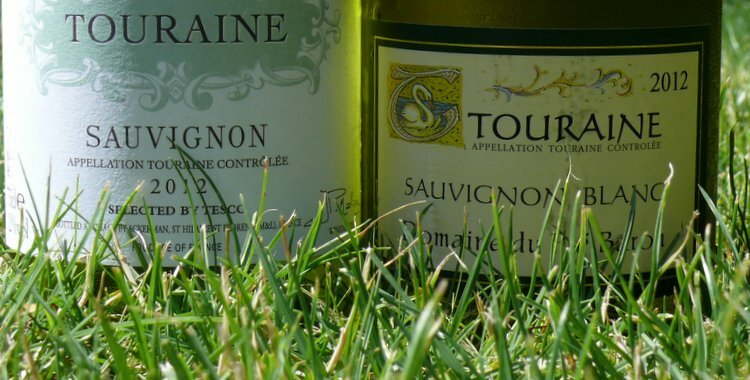 The two we had at the table on this occasion, pictured above with added grassiness, were Les Chaumes Touraine Sauvignon 2012, part of the Tesco Finest range (currently £5.99 a bottle online), and Majestic’s Domaine Pré Baron Touraine Sauvignon 2012 (£7.99). The former tasted a bit like you’d just washed your glass out and failed to dry it properly before pouring the wine on top. A bit watered-down, in other words, but decent. The latter I have now tried twice and stood out on both occasions, and I think is a good example of what Touraine does, at a good price. As with all my favourite food wines, it went perfectly with what I cooked, and – just as important – very well without it. Wonderful! I love every bit of this, especially the non-researched, wild assertion and the fishy-mouthed friends. Thanks so much! The wildest assertions are almost always the best. See, there’s another one for you.